Cloud email security solutions are the most cost-effective way to reduce spam levels and mitigate threats from phishing, malware and ransomware. With no hardware to purchase and no software to install, cloud-based email security solutions are quick and easy to implement, simple to administer and inexpensive to operate – typically costing less than $10.00 per year per employee. However, not all cloud email security solutions are the same. With spam detection rates averaging around 97%, many solutions allow 3% of spam emails to pass through their filters undetected. With spammers becoming increasingly sophisticated in how they deploy phishing and malware attacks, the likelihood is that 3% of spam emails that go undetected are more dangerous than most. Spam detection rates differ according to the mechanisms used by cloud-based email security solutions to filter emails and how they are applied. Most cloud email security solutions use RBL and SUBRL filters that check the IP addresses of incoming emails against blacklists of known sources of spam. Many also have the option of applying recipient verification protocols and Sender Policy Frameworks in order to reject emails addressed to non-existent mailboxes and spoof emails. Usually, cloud email security solutions also have some form of “learning technique” to apply spam ratings to emails according to their content and construction, or how they are most frequently dealt with. These techniques can go under various names such as “Bayesian Analysis”, “Neural Networks” or Adaptive Spam Filtering”, and administrators can adjust “acceptable spam thresholds” based on how well these techniques are identifying spam emails and the number of false positives they block in error. Manual intervention aside, the highest spam detection rates are achieved by cloud-based email security solutions with a greylisting function. When enabled, this function prevents emails from unknown sources of spam passing through its filters by rejecting every email and asking for them to be resent. Spammers´ mail servers, being too busy sending out fresh spam, never respond to “resend” requests, and spam emails are never returned. This function can raise the spam detection rate beyond 99.9%. Most security-conscious businesses implement two-way cloud-based email security – scanning their emails both inbound and outbound. The purpose of outbound scanning is to identify email accounts that may have been compromised by cybercriminals and to prevent outbound emails distributing malware to business contacts. Both scenarios could result in a business´s IP address being blacklisted – not only negatively affecting communications, but also any websites associated with the blacklisted domain. Compromised email accounts are of particular value to cybercriminals. Trusted accounts (i.e. corporate accounts with a good email history) can be used to distribute malware-infected spam emails to the business´s contacts more efficiently than trying to infiltrate each contact individually from a blacklisted IP address. For the business from which the spam emails are sent, the loss of credibility among its contacts can be just as damaging as if it had suffered a malware or ransomware attack itself. Not all infected outbound emails are due to the actions of a cybercriminal. In some circumstances it could be possible that an employee has introduced malware into the network via an infected USB flash drive or by connecting their malware-infected mobile device to the business´s malware network. Outbound scanning identifies unusual patterns and malware in outgoing emails to ensure the business´s primary channel of communication remains open and so that its IP address is not blacklisted in error. SpamTitan is a cloud email security solution that can support multiple domains and is therefore suitable for businesses of all sizes and Managed Service Providers (MSPs). Our cloud-based email security solution includes greylisting and outbound scanning among its many features, and achieves verifiable spam detection rates of 99.97% to minimize spam levels and better mitigate threats from phishing, malware and ransomware. Administration of our cloud-based email security is straightforward. Once implemented via a redirection of the MX record, domain administrators can apply acceptable spam thresholds by user, user-group or domain – using LDAP and Active Directory if necessary to accelerate the process. Thereafter, real time activity on the mail server can be monitored via a web-based management portal, which can also be used to schedule reports in order to identify new threats and conduct risk assessments. Being a cloud-based solution, SpamTitan is compatible with all operating systems and is infinitely scalable. There is minimal maintenance required as all updates are performed by us in our ILS-certified data centers; however, if you do ever encounter an issue, our service is backed up by industry-leading Technical and Customer Support. 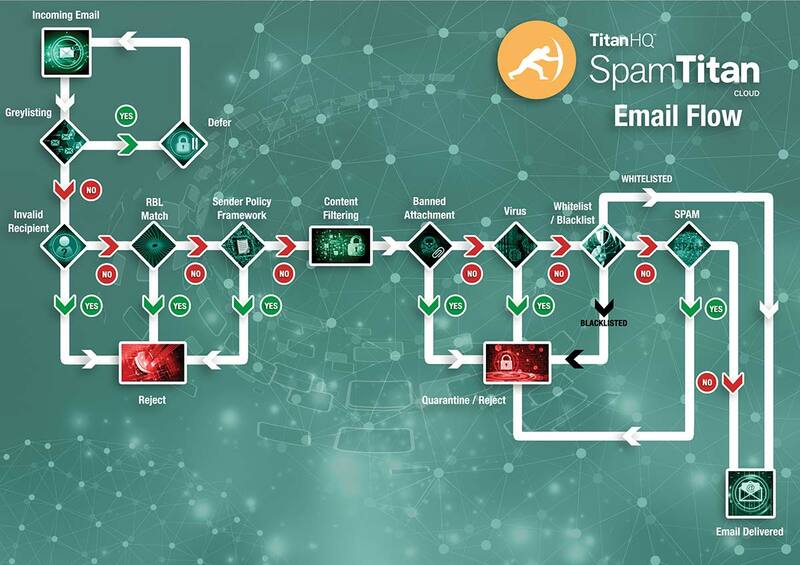 Furthermore, if you are looking to implement or upgrade a cloud email security solution, we give you the opportunity to try SpamTitan for free. By trying SpamTitan for free, you have the opportunity to determine the appropriate acceptable spam thresholds for your specific requirements in a real time environment with no commitment to continue using our cloud email security solution once the free trial has concluded. Should you subsequently decide to continue protecting your network with SpamTitan, we offer a competitive range of pricing option based on the number of employees, your preferred method of deployment and the subscription frequency. Contact us today to find out more.